Just Keep Sweating: Red Wine Anyone?I GOT TIME FOR THAT! I really have become the worst blogger, I am so sorry for being so MIA! I didn't even do my Biggest Loser recap post yesterday-- lets just say I still want Gina and Jeff off of the ranch, cannot stand them. 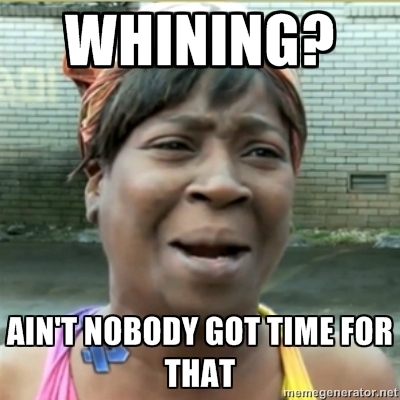 This season is chock full of whiners and it's making me crazy. You said it Sweet Brown. Last night after work I had a very special date so I picked up not one but two bottles of red wine. The Apothic Red is a long time favorite of mine but the Cupcake Red Velvet was new to me. I actually tried it after watching Truly Jess rave about it in her vlogs. It is now a new favorite for me! Becky made a delicious dinner that she found on Pinterest. Brown butter whole wheat pasta anyone? I already have plans for turning this into a cold pasta salad for the summer---stay tuned. The two of us ate and drank, while chatting and laughing until almost 10 pm. I can't think of a better way to spend a Tuesday night, can you? This morning I was off to my favorite workout. If you said kickboxing you are correct! I am toying with the idea of going back tonight for Shakin it [a really fun dance class] or Yoga, I guess I'll see where the day takes me and fill you in on that tomorrow! I really tried, and I will probably tune in for my favorite episodes...but I had to drop biggest loser this year, I just couldn't get into after a few episodes. I cannot stand Gina! I want to throw something at my tv everytime her face is on it. :) I especially loved the "I have my wallet and passport ready!" bit this week...I wasn't aware the TBL ranch had gone international. Love the blog! I miss your daily blogging - but I will take it when I can get it! Darn. I guessed rope climbing.